In the heart of Athens between Syntagma and Omonia, the city’s major squares, Titania has been offering the kind of hospitality and service that have made it a paragon of excellence for over thirty years. Titania’s central location puts Athens’ history, culture, shopping district, public transportation and vibrant night life within easy reach of Hotel guests, who can also take advantage of the Hotel’s convenient 24-hour parking. With its legendary hospitality and unprecedented service, Titania Hotel welcomes you to your home in Athens. Each of Titania Hotel’s 385 regular rooms, 10 executive rooms and 4 suites, tastefully decorated, soundproof rooms is equipped with thoughtful modern amenities and state-of-the-art technology to provide the ultimate in comfort, convenience and functionality: individual climate control; satellite and cable television; digital pay movies (Quadrica-Genesis); direct dial-phone; personalized voice mail; minibars; spacious bathrooms with luxury amenities (which feature Jacuzzis in suites only); hairdryer; safety deposit box; electronic key card door lock; 24-hour room service; high-speed internet access (via television set); ISDN lines; PC outlets and fax and modem ports. Non-smoking rooms are also available. Titania Hotel’s legendary hospitality, unparalleled service, comfortable rooms and convenient location will make you want to come back again. 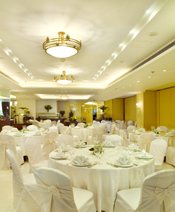 The Titania Hotel offers a wide range of dinning options. 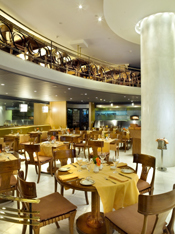 Located in the grand lobby of Titania Hotel, “La Brasserie” is the all-round, all hours, all occasions place to come, whether for a power breakfast or business lunch; an afternoon snack or any early cocktail; a post-shopping treat or an intimate dinner; a coffee and dessert or an after-theater something-or-other. La Brasserie's exquisite décor and sophisticated ambiance, enhanced by live piano every afternoon and evening and the longstanding hospitality and unprecedented service that have made it a paragon of excellence in Athens, make it the ideal place for a relaxing moment and a delectable meal. Indulge in a feast for the senses at the award-winning Olive Garden Restaurant on the roof of the Titania Hotel. 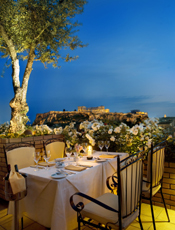 Feast your eyes on an exquisite view of the Acropolis, the Lycabettus and the city beyond. Whet your appetite with a refreshing cocktail or beverage from the bar in the atmosphere modern yet romantic, cosmopolitan yet Greek, upscale yet subdued. Savor a fine wine from our select international wine list and indulge in some of Athens’ most divine nouvelle Mediterranean cuisine. The Olive Garden Restaurant, with an actual olive grove, is the only eatery that serves gourmet fare and the Acropolis on the same plate! Treat yourself to a unique dining experience. Its unrivalled view, haute cuisine, elegant décor and live piano high above the vustle and din of the city make the Olive Garden an urban oasis that nourishes body and soul. Other amenities include concierge services, a beauty salon, laundry/valet services, mail and postage service, translation services, children’s crib and baby sitting upon request, doctor (on-call), handicapped accessibility, luggage storage, currency exchange and 24hour indoor hotel parking. Titania Hotel features some of the most tasteful contemporary venues in Greece. 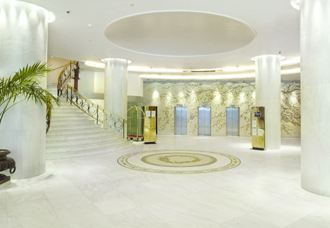 Ideal for large events or conferences, the Hotel’s stately Europa Conference & Banqueting Halls Nike, Apollo and Athena, together with the Olympia Foyer and the Vergina Restaurant, can accommodate up to 900 people. Fully soundproof, each of the three adjoining, self-contained function rooms is equipped with telecommunications facilities and state-of-the-art audiovisual equipment. Ideal for smaller social events and meetings, each of the venues on the 10th floor of the Hotel the Omiros, Socrates, Plato and Solon Halls has natural light and awe-inspiring view of the Acropolis, with a combined capacity of 350 people.